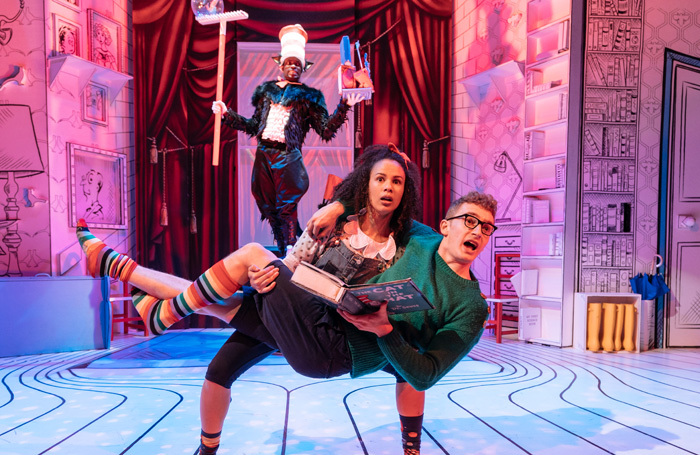 Katie Mitchell adapted and directed this stage version of the Dr Seuss classic for the National Theatre in 2009. It works particularly well in Curve’s intimate studio space, where the maverick circus performers, Thing 1 (Celia Francis) and Thing 2 (Robert Penny), twist and tumble in close proximity to the audience. Anarchy rules from the word go, with water pistol wars between Sam Angell’s staunch and bespectacled Boy and Melissa Lowe’s laddish Girl whipping the young audience to fever pitch. The character of Fish is a temperamental, hyperventilating operatic diva, whose dramatic arrival inside a self-propelled giant goldfish bowl is accompanied with showers of bubbles from above – a funky and altogether delightful performance from Charley Magalit. Nana Amoo-Gottfried is a very singular and superior Cat in the Hat, a maestro quite laconically doing his balancing acts. Part of the joy of Suba Das’ show is that you never know what’s coming through the door or the window or which part of the simple set is going to open up next. It’s physical theatre at its best; the only words used are those of the book, so it draws deeply on the actors’ mime skills. Sibling rivalry was never better expressed – or more fun.